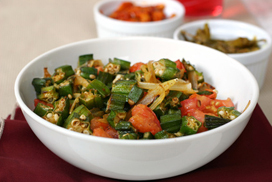 Wash, dry and then slice the okra into small slices. Fry spices, onion and tomatoes until soft. Add in the okra and steam for 15 minutes. Add a handful of fresh coriander leaves just before serving.